Why Choose a Chamber of Commerce Group Insurance Plan? Over 23,000 businesses nationwide have made the Chambers of Commerce Group Insurance Plan the First Choice among Canadian businesses. 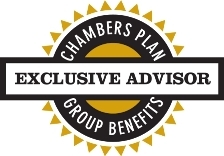 Offering security for business owners and their employees, the Chambers of Commerce Group Insurance Plan generates higher morale and increased production while raising the company’s prestige among potential and current employees. Developed with smaller firms in mind, the plan makes benefits available to firms with 1 to 100 employees in every type of industry. Virtually any business is guaranteed eligibility after just six months of operation. The Chamber of Commerce Group Insurance Plan was created for smaller businesses and is a great way for your company to obtain coverage with a high-value, flexible benefit plan. No matter your firms’s size, choosing a custom benefit programme is easy, affordable and free from the risk of large rate increases or cancellation. The Chamber of Commerce Group Insurance Plan is run on a non-profit basis with premiums set to cover the cost of administration and the benefits only. By pooling benefits together, the Chamber of Commerce Group Insurance Plan ensures that companies or industries are not singled out for rate increases or coverage cancellations due to excessive claims. This includes health and dental coverage. The plan strives for stability in costs and benefits. All participating companies are treated equally and new customers are never tempted with low introductory rates. Each participating firm takes a core of insurance benefits. These always include Life Insurance with Accidental Death and Dismemberment benefits. Additional options are then chosen from a wide range of contemporary coverage including health, dental, prescription drugs, short-term disability, long-term disability, business overhead expense, life insurance and retirement savings. In addition, the level of coverage for each benefit is set to suit each firm’s needs. Companies with a staff of more than 25 may wish to opt in to a self-insured programme which minimizes administration costs yet still provides protection for major claims. You make the choices and you control the costs! You choose from up-to-date options, decide on the coverage you require and select the depth of coverage from basic to comprehensive. A unique plan for small business. No Minimum Firm Size. Full benefits are available to firms with just one employee. Ideal for contractors, home-based businesses, farms and family businesses. No Industry Restrictions. All businesses are eligible regardless of occupational risk. Guaranteed Approval. With a minimum of 3 employees, options guarantee coverage without a medical questionnaire. Guaranteed Renewable. Provided you are a member of a participating Chamber of Commerce or Board of Trade and your premiums are up to date, your plan can not be terminated for excessive claims. Rate Stability. Claims are averaged and pooled with more than 23,000 companies just like yours, so you won’t be penalized with a large rate increase because of high claims.